Copyright 2012 American Society of Limnology and Oceanography, Inc.
Popular shipboard techniques to determine dissolved aluminium in open ocean seawater have two major disadvantages: relative to HPLC techniques, they require large sample volumes; and, in practice they are only semi-automated. 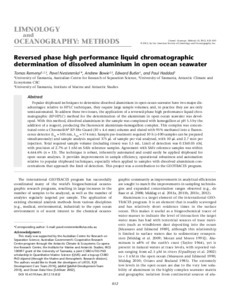 To address these two issues, the application of a reversed-phase high performance liquid chromatographic (RP-HPLC) method for the determination of the aluminium in open ocean seawater was developed. With this method, dissolved aluminium in the sample was complexed with lumogallion at pH 5.5 by the addition of a reagent, producing the fluorescent aluminium-lumogallion complex. This complex was concentrated onto a Chromolith RP-18e Guard (10 x 4.6 mm) column and eluted with 95% methanol into a fluorescence detector (λex = 505 nm, λem = 574 nm). Sample pre-treatment required 10 h (> 100 samples can be prepared simultaneously) and sample analysis required 375 μL of sample per vial analysed, with 10 μL and 2.7 min per injection.Total required sample volume (including rinses) was 1.5 mL. Limit of detection was 0.13 ± 0.05 nM, with precision of 2.7% at 1 nM on SAFe reference samples. Agreement with SAFe reference samples was within 4.6 ± 4.6% (n = 13). The technique is robust, inherently automated and could easily be applied shipboard for open ocean analyses. It provides improvements in sample efficiency, operational robustness and automation relative to popular shipboard techniques, especially when applied to samples with dissolved aluminium concentrations that approach the limit of detection. This project was a contribution to the GEOTRACES program.